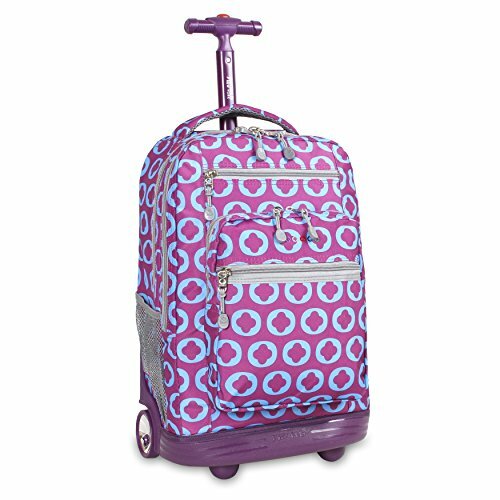 Wheeled luggage was such a fantastic invention. It allows us to carry so much more when we travel, and we don’t have to break our backs hauling our bags from one place to the next. But what happens when the ground is uneven or not suitable for wheeling? That’s when a rolling backpack comes into its own – if you’re not wheeling it, you can just throw it onto your back and carry it. No wonder they’re now becoming so popular, both as school bags and for travel. Just looking for the best backpacks for teens? Read our review. Here’s a guide to the best rolling backpacks currently available. This a great option for a school bag. You can carry it comfortably on your back, but when you stuff it full of books and it gets too heavy, it works well on the wheels too. It’s available in seven color designs and is suitable for boys or girls. There are quite a few things to like about this backpack. As a bag destined for school use, we liked the “Tilami Armor” that protects the bottom. Similarly, when in backpack mode, the wheels fold away and there is a cover to protect your back from becoming dirty. Another big plus is the multiple pockets in this bag; there’s plenty of scope for organizing books, laptops, papers and everything inside. We also find that the price for this well-designed bag is very reasonable. One problem is that, despite the many pockets, there is no dedicated laptop pouch. While you can easily carry a laptop inside, a specialized pouch would offer more protection. Also, larger laptops might not fit. Another worry is that this bag might not stand up to rougher treatment. This is an excellent option for college students. It’s a high-quality item available in nine different color schemes, it includes several pockets for organizing books, laptops and other belongings, and is water resistant in case you get caught in a shower. This backpack is designed for females. Kipling is a well-known brand and this model is more expensive than the other backpacks in our review. However, we believe this bag is worth the price. It is well-made and durable, so it should last you a long time. You will be able to fit your books and laptop inside, making it an ideal option for college; it also doubles up as a carry-on travel bag, giving it extra versatility. It’s easy to adjust, has a protector on the bottom – and it’s available in several different colors, all of which we love. One complaint might be that it’s a little small. If you’re the kind of person who needs to carry lots of books all the time, you might choose something bigger. Also, it has no dedicated laptop pouch – you can carry a laptop inside, but it will just be in with your books and other stuff. Still, no big problem. This is a bag designed for those who need to carry lots of gadgets and tech and who want to keep them all safe. There are lots of pockets, including a dedicated laptop pouch, and it’s water-resistant too, so you don’t need to worry if you’re caught in light rain. This bag is unisex. After seeing a lot of bags with no laptop pouch, this one is a clear winner for someone who needs to carry potentially-expensive tech with them. Laptops or tablets up to 17″ can be carried safely and securely inside. There are also dedicated pouches for other essentials like cell phone power banks. Some other features we liked include the rubber wheels which make very little noise when the backpack is rolling, and there is a cover for the wheels for when you need to carry the bag on your back. We also need to mention the extremely reasonable price – this bag is fantastic value. One potential issue some people might have with this bag is its size – some might actually find it too big. If you need to carry lots of gear, then it’s great, but it might not be ideal if you want something smaller. We might also question the durability of this bag – but at this price point, we think it’s ok. 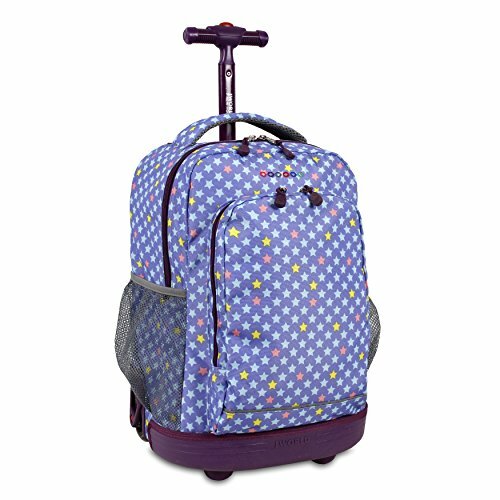 This super-cute rolling backpack and small bag set is ideal for younger girls who want to carry their own luggage. There’s nothing too complicated here, just one large main pocket to stuff toys and other necessities into, a couple of smaller outer pockets, and a second matching smaller bag. This rolling backpack is aimed at younger girls and, as such, it’s a great option. It’s small and manageable for pre-teens and is available in three color schemes designed to appeal to that age group. The second bag is ideal for carrying lunch in and is a nice extra touch. 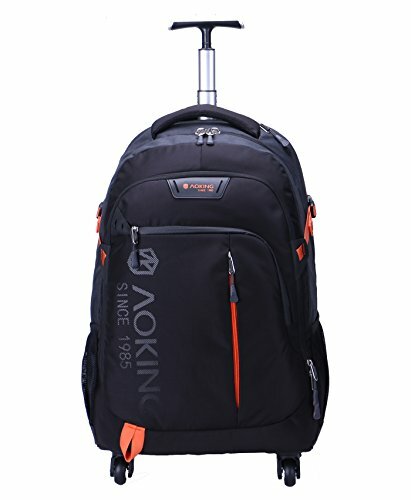 Unlike many other rolling backpacks, this bag can actually be detached from the wheel section – which means it is simple to convert to a regular backpack should you so wish. While this is not a bag designed to last for years, it is fine for younger girls – and it is priced very reasonably too. One flaw with this bag has to do with the wheels section. While we think it’s a smart idea for it to be detachable, sometimes it can come off too easily, even when you don’t want it to. Some people might also dislike the embroidered “Hello Xiaohn”, which is a little bizarre. Only for girls – not really suitable for little boys! This rolling backpack is designed with younger teenagers in mind and includes several features that make it particularly suitable for this age group. It has lots of pockets for them to carry their stuff, it’s waterproof, sturdy and even shock-absorbent to withstand mistreatment. Available for boys or girls. And yes, it does come in other colors! 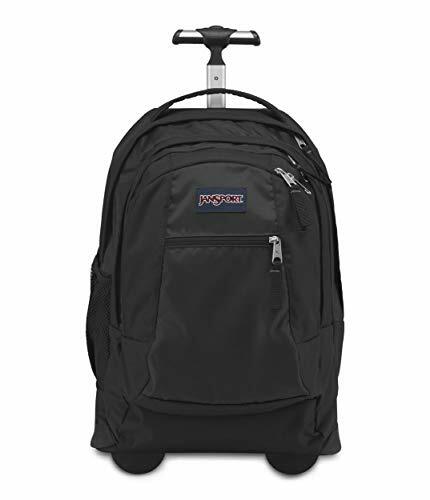 If you’re looking for the perfect rolling backpack for your teen, this could be the one you’re searching for. We know that teens can be a little “absent-minded” (or careless) with their belongings at times, but this pack will stand up to any rough treatment it receives. It has plenty of external pockets and pouches for storing whatever teens need to carry about, and the large size means they can carry plenty of books, devices and other essentials. This is another model with detachable wheel section, so it can be pressed into service as a regular backpack too. 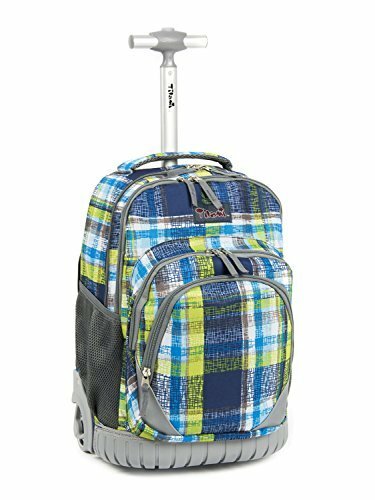 This rolling backpack is a great option for a boy who wants a no-frills, functional and high-quality bag. It is ideal for all uses, including school, travel and others. This bag is also available in more feminine designs that would be suitable choices for girls. This is a well-made backpack from a reputable, US-based company known for excellent customer service. We liked the big wheels that make it easy to roll, even if the surface is not perfect. It has a dedicated laptop pouch that can fit a device up to 15″ and also features a useful external pocket. The padded straps tuck away when in rolling mode, meaning they don’t get in the way. It has a large capacity, rated at 34l, and is generally a high-quality, well-made product. These are built to last – but should you have any problems, Jansport offers a lifetime guarantee. For some, perhaps the main problem here would be the price. While this is an excellent product, at this price, you would expect perfection – and there are some small issues. For example, when fully loaded, the backpack has a strange, ungainly shape some people might not like. 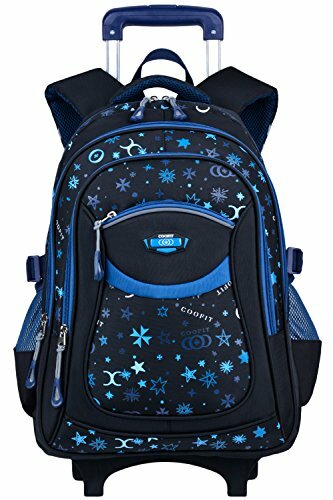 This is the perfect choice for someone looking for a girls’ rolling backpack for use at school and also for travel. 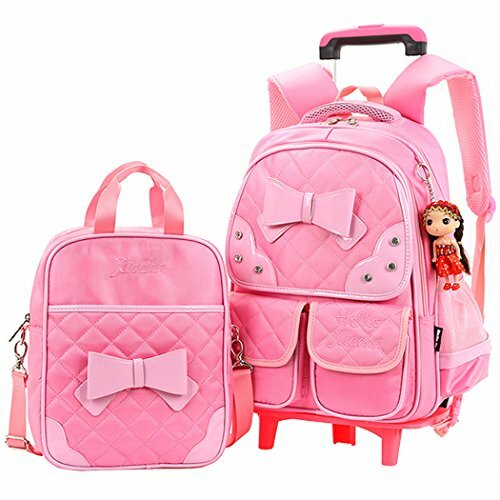 It is big enough to carry schoolbooks and a laptop around all day and the attractive color means your little girl should really love it. There’s so much about this rolling backpack to love. One of the best design features is the large wheels that make it more stable when you’re wheeling it. With the breathable straps, it’s also very comfortable to wear on your back. It is quite spacious for a small bag and has plenty of compartments and pouches to organize your stuff, including pencil and key holders. The wheels and base are sturdy and can stand up to punishment. It’s water resistant and also has a reflective strip for extra safety at night. Our main concern here is that, while the wheels are strong, the straps, zippers and seams appear to be less so. We worry that after a period of sustained use, they might begin to show signs of wear. Also, older teens or adults might find this backpack a little small. A fantastic lightweight rolling backpack for those who don’t want to be carrying around heavy luggage before you even put anything inside. This bag is a good size but only weighs about 5lb, meaning it’s not going to break your back when you have to carry it. Apart from the obvious advantage that this is a very lightweight backpack, one of the things we love is the almost bewildering choice of color schemes. It doesn’t matter who you are or what style you like, you are sure to find one to suit you. On a more practical note, it’s well-designed, comfortable to wear, and easy to roll. Another positive is the handy laptop pouch designed to keep your computer or tablet protected and secure in your bag. On the downside, we have some minor doubts over the workmanship of this bag. We think it’s good quality for the price, but we think that more expensive options are probably likely to have a longer lifespan. Also, even though this is a very light backpack, it might not be suitable for a smaller child to carry on their back. Here are some of the things you need to look out for when choosing a rolling backpack. Rolling backpacks are available for younger kids as well as teens. Make sure you choose one that is the right size for your child – but also that they won’t grow out of it too quickly. Rolling backpacks are usually heavier than regular backpacks and they’re designed to be. That’s why they have wheels – if you put lots of stuff inside and don’t want to carry it anymore, you can put it down and wheel it. However, it still shouldn’t weigh too much for your child to carry. The material the backpack is made of is important. Many options are available, but you should make sure the materials are suited to what it will be used for. Also, consider whether you need it to be water resistant. The wheels are one of the most important features. Are they made of cheap and flimsy plastic or something that will last longer? How well do they roll? The overall durability could be an important consideration. For younger kids, a cheaper, less rugged backpack might be suitable. For older kids taking it to school or college every day, you might need to spend a bit more money on something that will last. Obviously, the backpack should be comfortable to wear on the back as well as easy to roll when on the floor. How easy is it to pull out the handle? Is it a telescopic version or retractable handle? Is it easy for your child to use? Think about the overall quality. We mentioned the materials the bag and wheels are made from. How about the workmanship. Is it well-made or does it look like the stitching will fall apart after only a few weeks of use? For younger kids who just want to stuff a few toys inside, this might not be so important, but for school kids or older, they will benefit from compartments inside and pockets outside. This makes it easier for them to store their stuff and find what they need quickly. A vital consideration nowadays for schoolkids and up. Most kids now take a laptop or tablet to school – does the bag have a dedicated section to store it? How well does it protect the device? This is especially important if your kids carry expensive brands like Apple. Whether you’re looking for a backpack for small kids or school kids, for college use or for travel, we hope our guide has been useful. We’re sure you will be able to find the perfect rolling backpack for your requirements – any of these backpacks would be a great choice and we can recommend them all. ParentingMonkey.com is a participant in the Amazon Services LLC Associates Program, an affiliate advertising program designed to provide a means for sites to earn advertising fees by advertising and linking to amazon.com.